Sophie Cummings, Curator at the Museum and Art Gallery, gave a talk last Friday night on the exhibition of Modern British Landscapes she has put together to compliment the 'Turner's Watercolours in the West' exhibition which runs until the 13th December. Sophie talked about the history of landscape painting via a series of slides of these paintings- starting with Salomon van Ruysdael's 'Landscape with Farm' from 1631, onto Gainsborough's 'Mr and Mrs Andrews', Constable's 'Flatford Mill' and onto Turner's 'Malmesbury Abbey'; the latter being part of the Turner exhibition. And on to Philip Wilson Steer's 'Boats in Harbour' painted in 1920 and purchased by T.E.Lowinsky for the Contemporary Art Society and presented by the Society in 1946. Lowinsky lived in Aldbourne and Steer was a friend of his. and Barbara Howey's 'Pagoda' 2012. I have also used the 'Guide to the Swindon Collection of Twentieth Century British Art' available in the shop for some of the information. The next talk is tomorrow evening at 7pm. Magnus Quaife who has 3 pieces in the Swindon Collection will be in conversation with Sophie Cummings. On the 20th October, we were lucky enough to be given a guided tour of the new Prehistoric Wiltshire Gallery, by museum director, David Dawson. The displays feature 500 Stonehenge period objects, including 30 pieces of gold treasure excavated from Bush Barrow near Stonehenge displayed permanently for the first time. As a member of the Friends committee, I was fortunate enough to be invited to the opening night of the new exhibition which includes eight JMW Turner watercolours on Tuesday 14th October. It's an exhibition spanning Turner's career from student days to mature style, including views of Bath, Bristol and the surrounding area. It is presented by Frameworks, a partnership of Bristol Museum and Art Gallery, the Holburne Museum in Bath, The Wilson in Cheltenham and Swindon Museum and Art Gallery and the Victoria Art Gallery in Bath. Frameworks aims to raise the profile of the 5 art collections. Apart from seeing the exhibition before it officially opened on the 15th October, it was a very pleasant night with speeches by the Curator, Sophie Cummings and Cllr Brian Mattock, Deputy Leader of the Council who updated us on plans to apply for funding for the new museum and art gallery. And below, the lovely stained glass windows at the front door. The exhibition runs until 13 December and can be seen from Weds-Sat 11am-3pm. 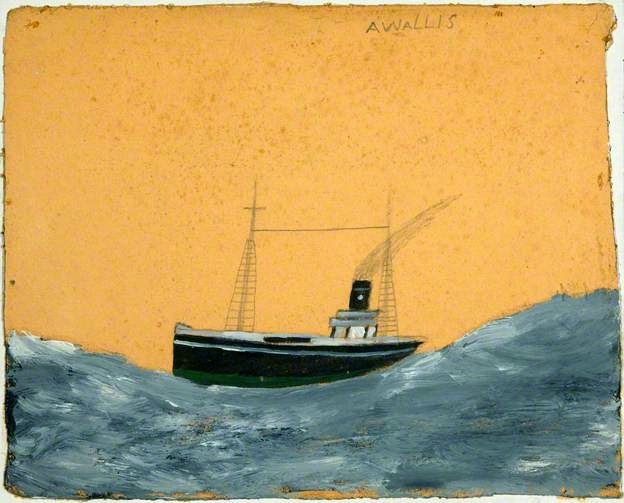 on Friday 24th October at 7pm, she will talk about how war and urbanisation encouraged British modern artists to depict the landscape. 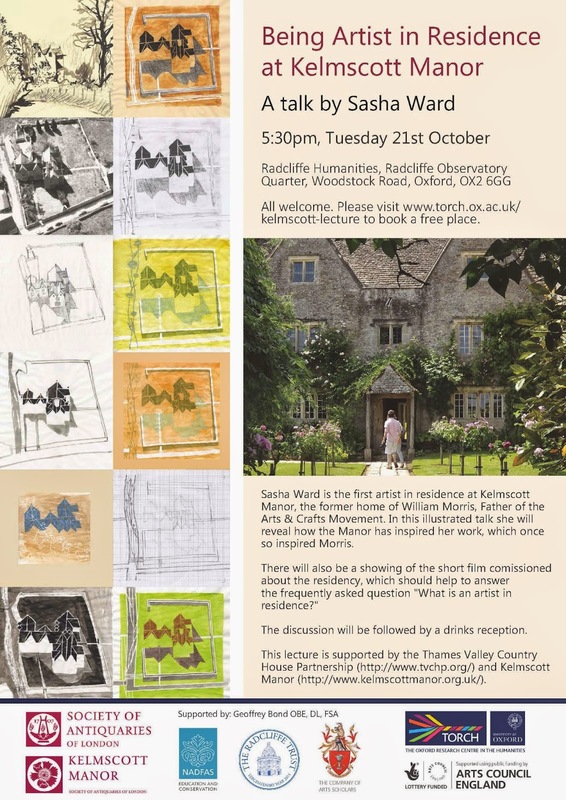 Talk in Oxford on Kelmscott Manor Artist in Residence, Sasha Ward. Friends may remember some years ago when Sasha Ward gave a talk on her work as an architectural glass artist and then more recently when she spoke about Matisse to accompany the Matisse cut outs exhibition. Over the summer she has been artist in residence at Kelmscott Manor, near Lechlade and is giving a talk about her time there in Oxford. For details see below (click for large image), the talk is free but book via the link below if you want to go as spaces are limited. 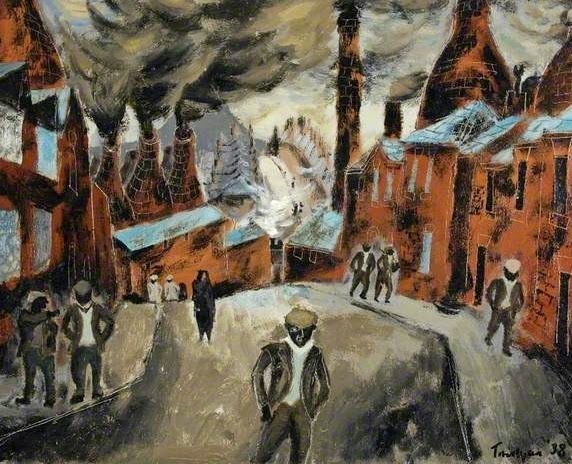 One of the most popular paintings in the Swindon Collection is probably 'The Potteries' by Julian Trevelyan. While on the trip to Marlborough College and St Peters Church I found a copy of his autobiography 'Indigo Days' in the Church book sale. Published in 1957 it's a fascinating read of life from the artists point of view and he talks of his time in Stoke on Trent when he made the painting. 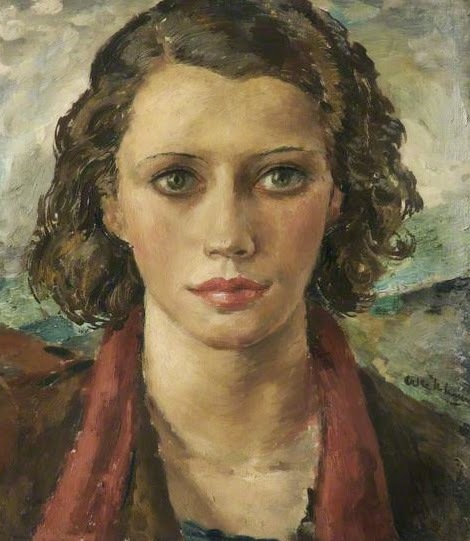 This work was made when he was involved in the 'Mass Observation' social research organisation in the 1930s with the likes of film maker Humphrey Jennings and anthropologist Tom Harrison. You will notice the names of other famous artists of the time including some in our collection, Michael Wickham who is sadly not, is mentioned by Trevelyan as they were great friends. 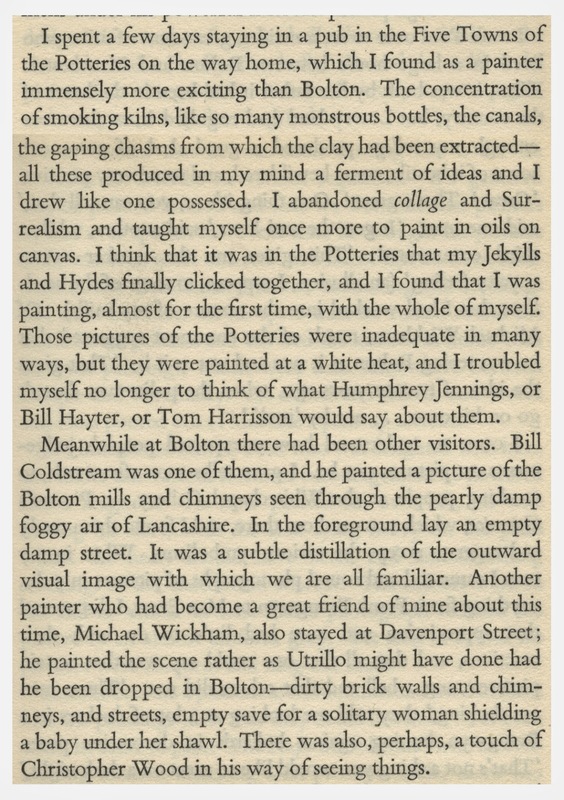 For awhile their work was thought indistinguishable although the example below painted in Salford for Mass Observation doesn't really show this. Wickham who went to Marlborough College lived at Coleshill for some time where he created and landscaped the gardens around the site of the old house, now in care of the National Trust and best remembered for being the home and training ground for Churchill's Secret Army, The Auxillers.